Don’t let your favorite music be the cause of your hearing loss! Our ability to hear, as well as the health of our ears, is an incredibly important part of our overall health. While regular visits to the audiologist are an excellent start for maintaining excellent ear health, we must also protect our ears from potential damage in certain situations as well. Summer, in particular, is an active season full of concerts, outdoor activities, and traveling. For this reason, keep in mind the many circumstances in which your hearing will need extra protection with the use of earplugs. If you find yourself traveling this summer, it may be a good idea to pack a pair of earplugs in your carry-on. Air travel can have serious effects on your ears through pressure changes during take-offs and landings. 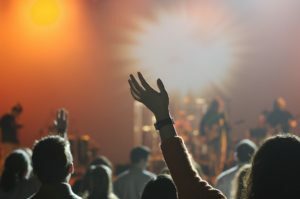 While rocking out to your favorite band may be fun, it can also present some potentially detrimental effects for your hearing. Don’t let your favorite music be the cause of your hearing loss! With the right earplugs, you can safely enjoy the songs that you love all summer long. Similar to concerts, professional sporting events can be risky for your hearing due to the prolonged exposure to loud noises throughout the day. If you find yourself attending loud baseball games throughout the summer, consider using earplugs to avoid causing damage to the ear from loud music, sound effects, and crowds. Much like the distraction that light can cause to our brains, noises can also affect our ability to sleep soundly throughout the night. Consider using earplugs as part of your nightly routine, especially if noises frequently awaken you throughout your home as you sleep during the week. With a great night of sleep, your overall health will improve over time as well. This entry was posted on Friday, July 13th, 2018 at 11:30 am. Both comments and pings are currently closed.